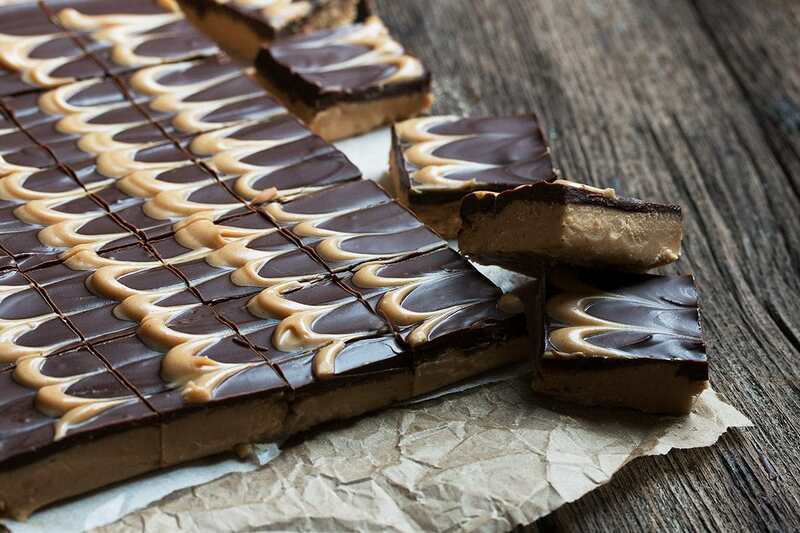 These No-Bake Peanut Butter Cup Squares are peanut butter cups in homemade, square form. Nothing extra in these ones. 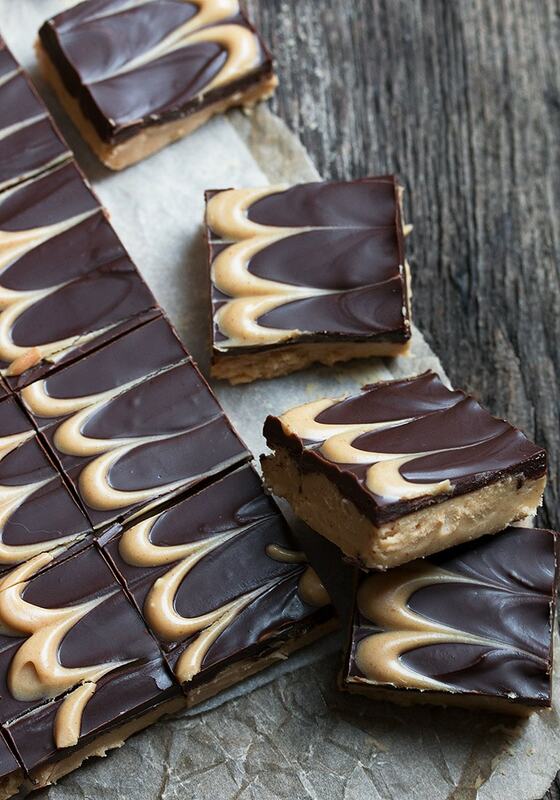 Just pure buttery and sweetened peanut butter and chocolate deliciousness. Happy Peanut Butter Lovers Day! 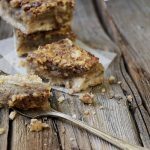 I have to admit, I’m not a huge follower of these “national food days”, but when I happened to see that this one was coming up, I thought it was a perfect opportunity to share one of my favourite guilty pleasures – these No-Bake Peanut Butter Cup Squares. I have made a lot of peanut butter and chocolate squares over the years, but I always come back to this one. Why? Because it’s pure, unadulterated peanut butter cup goodness. No extra stuff in these ones. Just silky smooth, sweetened butter peanut butter with a chocolate topping. 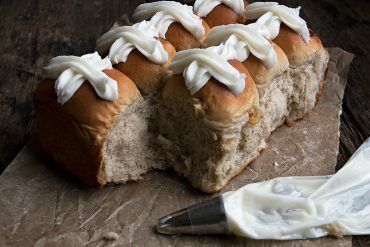 And in classic go-big-or-go-home fashion, these have an added swirl of more buttery peanut butter. The only downside to these squares is that while they are certainly slicable, as you can see, they need to be refrigerated and even at that, they are on the soft side. That is owing to the fact that there’s not extra stuff in there to make them stiffer. But again, that’s a good thing. The peanut butter cup flavour you crave doesn’t have that other stuff in it. These will keep in the fridge at least a week, probably two (but they never last that long here!). I like to use unsalted butter for these and add salt to taste. If you are using salted butter, you won’t need to add additional salt to the peanut butter layer, but taste your filling and decide. As these are no-bake, the filling flavour isn’t going to change. Speaking of salt, I will often sprinkle the top of these with flaky salt (fleur de sel or Maldons) while the chocolate is still wet. If I know I will be doing that, I keep the salt in the peanut butter layer a little lower, to keep that perfect sweet/salty balance. Like the salt, you’ll want to adjust the amount of icing sugar added to the peanut butter layer to your taste. I’ve used anywhere from 1 1/4 cups to 2 cups. I personally find the 2 cups a little too sweet for my taste, but your mileage may vary. I usually land in the 1 1/4- 1 1/2 cup range. 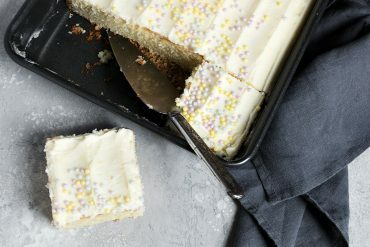 In any event, the amount of icing sugar you use doesn’t significantly change the finished texture of the squares, so experiment to find your sweet spot here. I use one of those dollar store plastic squeeze bottles to do the swirl thing (to make the lines), then run a skewer through them. 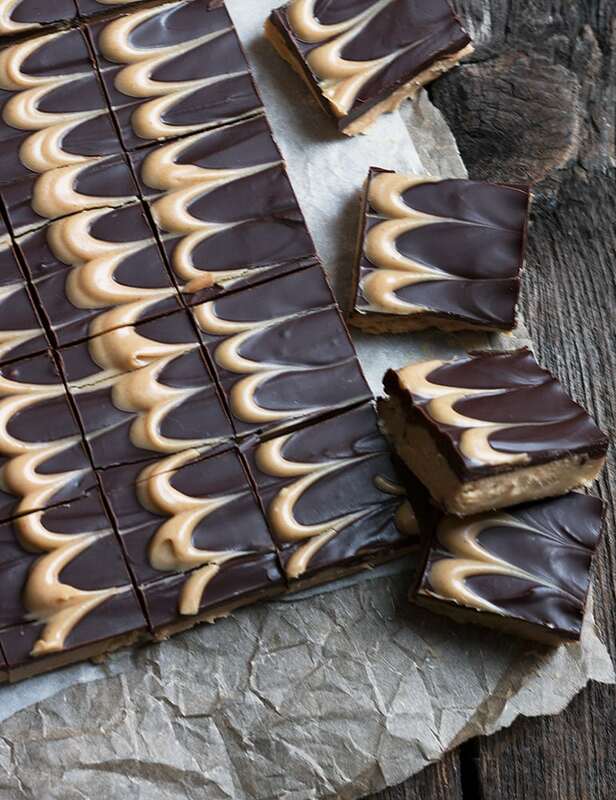 When running the skewer through, be sure your don’t go too deep (into the peanut butter layer), as it makes a weak spot that may cause your squares to split in the wrong places. You don’t have to get that fancy if you don’t want. Simply dropping a line from a spoon works too, or just drizzle. You can do a marble effect to, by topping with drizzle, then swirling a skewer through it. And all that said, if you’re not feeling the extra step of the swirl, you can just skip it altogether. Easy no-bake peanut butter squares, that are pure peanut butter cup delicious. 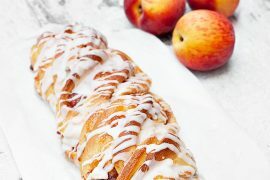 Spray and 8-inch square baking pan with cooking spray, then line with a sheet of parchment paper that covers the bottom and two sides, extended a few inches over the edges. Set aside. In a large bowl, stir together the 1 1/2 cups peanut butter with the 1/2 cup melted butter. *Note, it doesn't come together easily at first, so start stirring slowly to avoid splashing out. Add vanilla and stir to combine. Add icing sugar 1/2 cup at a time, stirring in until smooth each time. 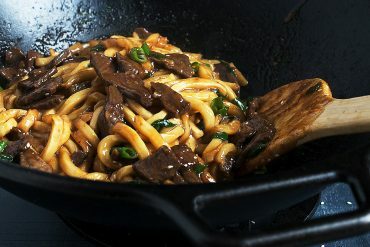 Transfer to prepared pan and spread to an even layer. Smooth top as well as you can. Place chocolate and butter in a microwave-safe bowl. Microwave for 30 seconds. Stir, then microwave for a further 20-30 seconds. Remove and stir until smooth and glossy. Pour chocolate over peanut butter layer, pouring into the centre and spreading out to the edges with the back of a spoon. 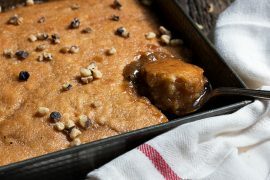 In a small bowl, combine 2 Tbsp melted butter with the 1/4 cup peanut butter and stir until smooth. Let stand to cool and thicken slightly, 3-4 minutes. Using a spoon or a squeeze bottle, make 1/4-inch thick lines with the peanut butter mixture about 1 inch apart. Using a skewer, run lines in the opposite direction, about every 1/2-inch apart, making sure you only run through the chocolate layer and not down to the peanut butter layer. 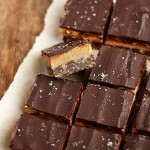 *If desired, you can sprinkle top of chocolate with finishing salt such as Fleur de Sel or Maldon's. 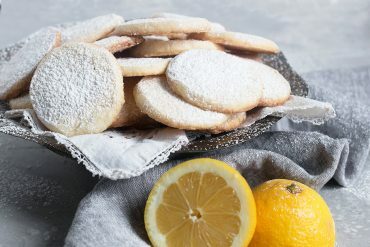 Adjust amount of icing sugar to your taste for sweetness. 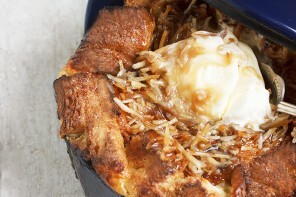 It will also depend somewhat on the sweetness of your peanut butter. I typically use 1 1/2 cups myself. If you use salted butter hear, omit the added salt. If you used unsalted butter, add as much as you like, to taste, from a pinch to about 1/4 tsp. Classic combination of flavours, together in a lovely square. 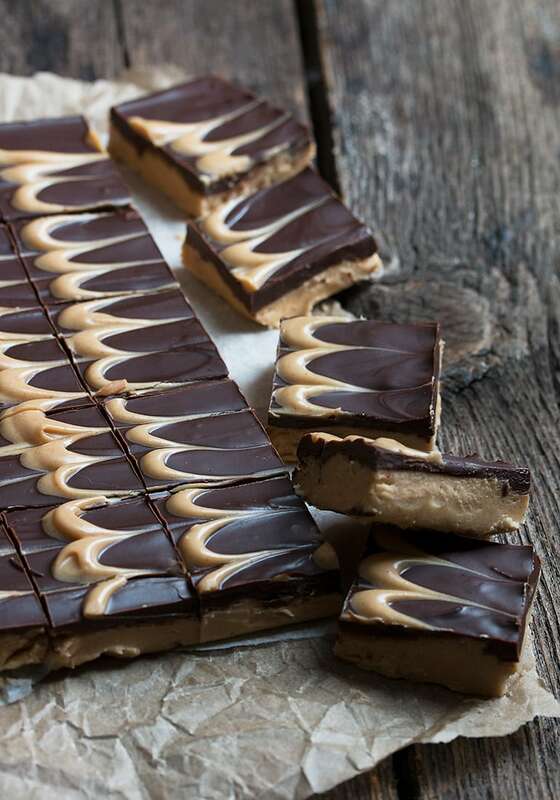 A twist on the Canadian classic, with a peanut butter layer. I used a tad bit more than 1.5 c confectioners sugar, but mine came out a decent amount thicker than yours (using the same 8×8 pan). I would prefer them thinner. They are tasty (how could they not be), but there is not enough balance of chocolate to peanut butter for me because they are so thick. I also had some of the top chocolate layer separate when I was cutting (but I cut them into smaller pieces since they are so rich – ended up with about 60 pieces). 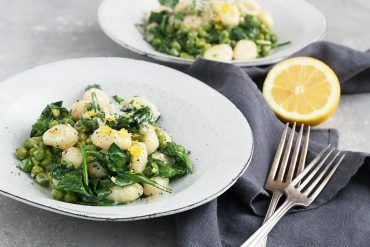 I am not likely to make them again since they really do seem to need to be served from the fridge and I would like something a little more versatile. My husband’s favorite combination of flavors and did not disappoint. He returned for seconds and all he could think was to have soft serve ice cream on the side and that would be the “bomb.” They taste better than a peanut butter cup and they are easy to assemble. Agree with everyone here – I’m definitely making these in the future. I doubt these would last long in my house. Jennifer, thank you for all of your amazing recipes. In the last 5 days I’ve made the breakfast rounds and these. All of your recipes work, which I really appreciate! These are crazy delicious. I made 1/2 batch in a 8 1/2 x 4” loaf pan because I knew a full batch was a dangerous thing to have in the house. Just wondering if you’ve considered putting weight measurements in your ingredient list? I find that such an easier and faster way to measure ingredients. 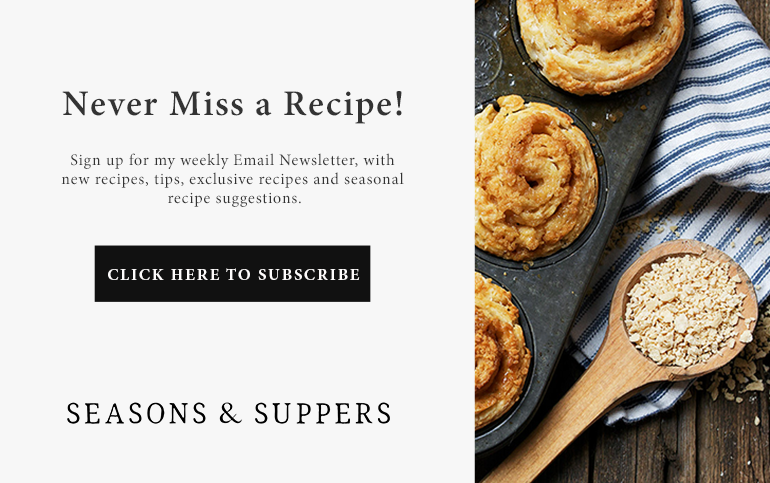 Hi Carolyn and thanks so much :) I too am a big fan of weighing ingredients, so I include the option to toggle between Imperial and Metric measurements with many of my recipes (you’ll find it below the list of ingredients – the red links). Wow. That’s the only thing I can think of to say, you’re amazing, sharing! Nothing better than the chocolate peanut butter combo Jennifer, so I’m totally in for this food holiday! These sound and look absolutely FABULOUS! Oh. My. Gahhhh. I’m with Dawn – I definitely see these in my future! So beautiful, Jennifer! Be still my heart! 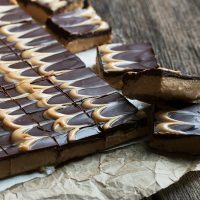 I adore peanut butter and chocolate and your gorgeous design on top is fantastic! 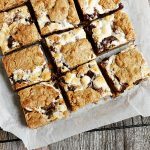 Love, love, love these no-bake bars. Sharing and pinning. These squares are just gorgeous, Jennifer!!! And I can’t believe they are no bake too!! These are brilliant… and dangerous, because I could eat way too many of these! ;) Cheers! These look gorgeous with the marble effect, Jennifer! You make them sounds really simple too:) On my list of to try sweets.